Has developed a flexible and practical method of teaching, based on fulfilling the desires of our students. We like to teach our classes using practical exercises and conversation. We mix a variety of games and role-play exercises into our classes to make them enjoyable. We believe learning should be fun, and our lessons are always lively. We offer both individual and group lessons to suit your needs, from 9 a.m to 7 p.m Monday through Saturday. Each class lasts for fifty minutes, and you will have at least four classes each day, with breaks in between. We will do our best to accommodate your scheduling needs based on the type or courses you want to study, our current enrollment, and your particular desires and abilities. We have found it best to organize a schedule upon arrival. A1 Beginners Classes to develop an ability and confidence with the Spanish language, so the student can master basic communication and interact with native speakers. A2 Beginners Classes that allow the student to maintain simple conversations in familiar environments and daily situations. 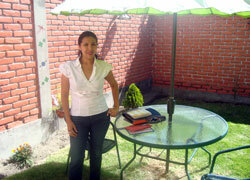 These clases allow students to express ideas in the present, and introduces basic use of the past, and future tenses. B1 Intermediate Lessons that develop the students ability to communicate with competency, and to engage in conversation on their experiences, with a developed understanding of the past and future tenses. B2 Advanced These more advanced lessons are intended to teach the student additional language structure, so they can then participate effectively in oral and written discussions using all the past tenses and introducing the use of the subjunctive. At this time, the student will have a developed ability to express ideas, using the correct tenses. 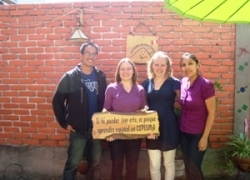 C1 Superior At this level we further develop the students knowledge of the Spanish language and the Peruvian culture, eliminating errors, and speaking the language more fluently. At this level the student will have an improved ability to understand Spanish media (television, radio, newspapers, and magazines). C2 Improvement Further study of the language to eliminate, and differentiate the minor linguistic subtleties that exist within the language. The ability to understand, and use idioms of the language in conversation. We can offer grammar and conversation lessons for groups or individuals for 2 to 8 hours a day. To help you learn conversational Spanish we use magazines, newspapers, books, games, and engage in dialogue. We even use music, and can go and visit local places where you can mix your study while experiencing our rich Arequipenian culture and traditions.